Here is a list of what colors and how many of each color are still available... It is not as many as many may think.. I mentioned to several people in private messages that we were much closer to being sold out of the group buy custom stock than it may appear. Not every one posted as I had hoped they would. But as you can see from the numbers below there are not many left. Hey guys, I spoke with Dale this morning and due to the delay with the samples he has agreed to extend the group buy until January 31, 2018. We felt it is only fair because many members are waiting for these lights to be tested and reviewed before considering a purchase. My own samples have been shipped separately. The XHP 70.2 version should arrive by the end of the week if not earlier. I only have to work 2 nights this week so it should work out that I can begin as soon as I have it in my hands. I already have everything set up and calibrated so I am ready to get measurement and and distance calculations finished quickly. And of course I will take video as well as still shots of almost anything everyone is waiting for. Hopefully I will have that one completed by or before the weekend. The 35 high version will be shipped on 1-11-2018 also using DHL so I hope to have it by Maybe Wednesday of next week and work or not I will begin on it very quickly and get the side by side footage that most every one wants to see as well as distance calculations. I will be putting those distance estimations to the test as best I can. I am sorry for the delay but I thought it would be better to extend the group buy so everyone has a chance to see the performance before making a purchase decision. I am sorry I am a bit behind, I had hoped to have this completed a few hours ago but I had a few matters to take care of. 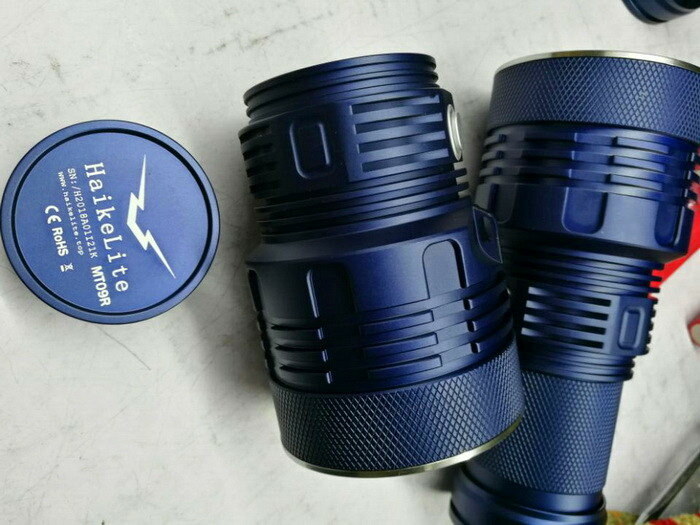 This is the official Group Buy Page for the Haikelite MT09R and this is the only group buy that members are able to choose 1 of 5 different colors as well as emitter tint. This group buy is limited to only 300 units total. The team at Haikelite made that decision before I even posted the feeler, so I am pretty sure no matter how much I may try to ask for more they will stop at 300 total. I have agreed to coordinate the group buy (take It easy on me please) and I will be playing a different role with Haikelite in the very near future so I am not ordering one for myself. I would rather all of you guys get your lights ordered. If there is 1 open slot left I may order one but for now I will not be ordering for myself. Because many will be requesting a color of their choosing from the listed colors Dale has asked that members make a very small down payment when you post how you wish your light to be configured. $15.00 U.S. the PayPal account is under this username haikelite@yeah.net. If it is possible he would like the balance paid by 1-15-2018 (told ya this is gonna be fast) he can go as late as 1-20-2018 but it will slow your shipment a bit. The goal is to have all shipped by 1-20-2018. When you make your down payment please also include a message to Haikelite with you real name for shipping as well as your BLF username please, your address you want them to ship your light to and of course how you want your light. 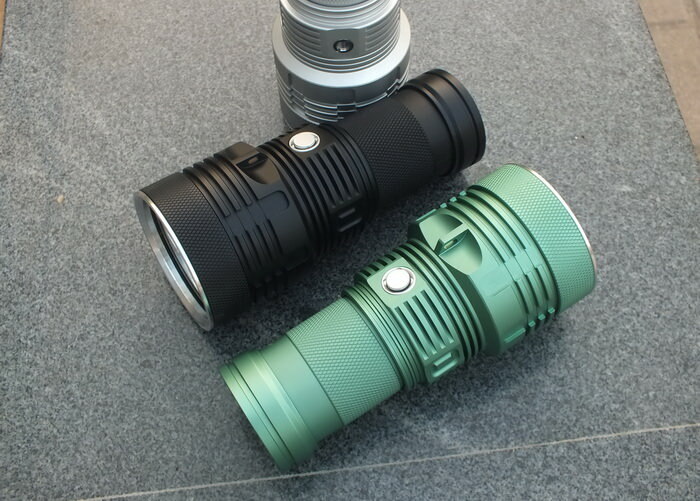 The color you choose emitter tint and if you want the 18650 cells as well. Please remember to do this so that everyone gets exactly what they ask for and it is shipped to the correct address. You can choose from 3 emitter tint. For the model using the 70.2 emitter there is WM (Warm White) CW (Cool White) NW (Neutral White) No extra charge. This is a bonus, I was not aware of the Warm white choice until a few minutes ago. Now for model using the 35 high there is only CW (Cool White) and NW (Neutral White). THIS JUST IN... Dale contacted me moments ago and has decided to add a charging unit they designed for these lights and the MT03. It charges 4 18650 cells... wow right... I'm just getting started. It also works as a powerbank and has an emitter of it's own for situations you get caught with no power. The price he is allowing for this group buy only I tried to get him not to go this low. Flat manufacturer cost. 3A input charing to charge batteries ; 2A output charing for mobil phones. The SMD LED's are warm white (no choice). He is sending me a picture of the prototype shortly and I will add it as soon as he does. Now the best part. If you order the MT09R and only during this group buy. The price is $10.00. I've bought stand alone 5k mAh power banks that cost more. 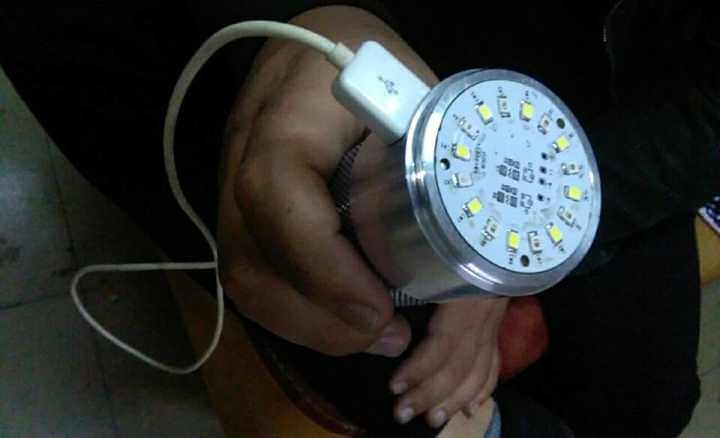 This charges 4 18650 and can double as a powerbank that will beat most If you are using 3000 mAh cells that is a 12k mAh power bank, charger with a light built in. Just add to your order and it is only $10.00. I promise you that it will not retail for that price so buy it while you can get that price. This really should be pretty smooth, but I think every person that has ever said those words later said “What was I thinking” lol. Samples have been shipped and will be arriving sometime in the next 5 to 7 days. For those of you that asked that I do both for side by side. I think Dale has decided I will get a sample of each. I will get those pictures and video shots posted as fast as I can. I know everyone is ready to see these in action and really want to see the differences. I am eager as well. LOL I may miss a night of work if need be but I will get the calculations posted as fast as I can. I would like to ask a single favor from everyone please. Because I work a stupid number of hours as well as our little store. I have days that there is just not enough time. Any discussion please use the feeler thread for that. Please leave all posts here for only members posting an order. Most will be a little different, so I must make sure I do not miss any information posted in an order request. We can all talk all we want on the feeler thread. I really need this to be as clean as possible so as I take the information it is as simple as possible. I want everyone that orders to get exactly what they wanted. Lets have a blast, this is going to happen fast. Only 300 with all of these options so I would dive in hard. I honestly believe this light will top all other models so far. Everyone that gets samples for reviews please be sure to get some beam shots up as soon as you can please. I will help any way I possibly can. If it happens to be a work night it may take a but for me to answer but I will answer. This week I have 3 nights left, Friday, Saturday and Sunday nights. After that I only work 2 nights all of next week so more time. Thank you all again for the turn out and support and Dale thanks you all for you continued support for the Haikelite Brand. If the GB doesn’t hit 300. I would like also a Sand Tan NW XHP70.2 with batteries. Thank you Dale and Terry. One tan with 35 hi’s in NW please. Plus batteries. Deposit paid. Thanks for organising this, Terry. Much appreciated. I will take a blue one with XHP70.2 NW. And may be a sandy one with XHP35 NW ( if the 300 don`t hit). 15$ paid for XHP70.2 NW, blue! I will take a blue one with triple 35 high CW and may be a sandy one with triple 70.2 NW. Terry thank you very much for organising this! I would like a sand tan MT09R triple 35 HI WW or NW. Do you have any specific info about the different emitter options ?, and would it be possible to buy a spare MCPCB. $15 paid. thanks for doing this. Put me down for 2 pcs XHP70.2 NW color deep blue. 1pc MT09R with triple XHP35 HI CW, Deep blue, with VTC6 batteries. I want a MT09R Sand/Tan, XHP35 HI, NW, no batteries. What Informations do we have to deliver in the Paypal Payments? I would like a sand tan MT09R triple 35 HI WW or NW. Do you have any specific info about the different emitter options ?, and would it be possible to buy a spare MCPCB. $15 paid. thanks for doing this. Dale just signed off. I do not see that he would have a problem but I am not sure what he has on hand right now. Send him a PM please. If you do not hear back from him by around 3 or 4pm EST send me a message and I will get an answer for you..
What Informations do we have to deliver in the Paypal Payments? BLF Username? Adress? 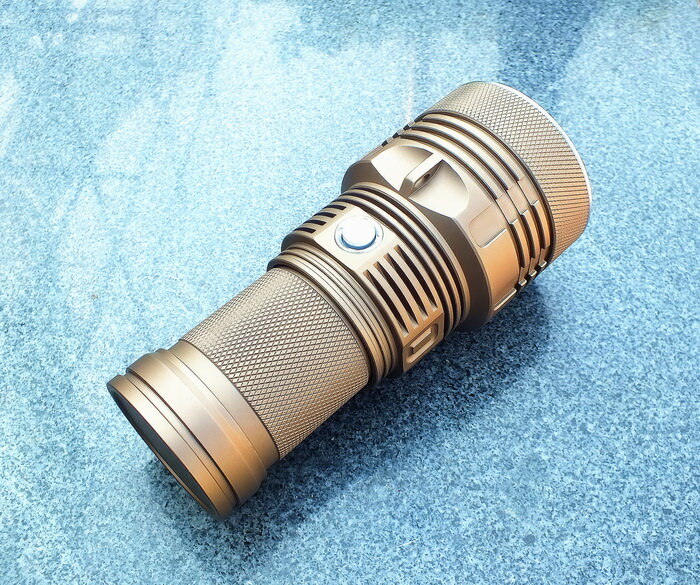 Flashlight-Configuration? I just edited and added that... lol and I am so glad I did. That will save me so much work . I am not ordering so I just totally forgot all the information Dale needs can just be left using PayPal lol. 30$ paid deposit for 2 pcs. Order for tan/gold XHP35HI in warm white or neutral white with batteries. Dale, can you provide more info on the warm white and neutral such as tint bin, CRI rating and lumen output? 1x green HXP70.2 warm white for me. Is there anymore info on color temps and CRI? How come still no proper review of the light samples? So far we only see two beam shots of XHP35 and 70.2 comparison…….I like to see the runtime graph for turbo and real lumen test. I just edited and added that… lol and I am so glad I did. That will save me so much work . I have read it in the op and changed / edited my question. I thought I have over read it. Now the question is, if the price includes paypal fees. Should we pay for goods or send money to family and friends? You MUST pay for goods if you want PayPal Buyer's protection. If you send money to family/friends then there is NO PayPal buyer's protection.